This book is about India's sustainability. It has been written with intent to provoke a debate across the country. 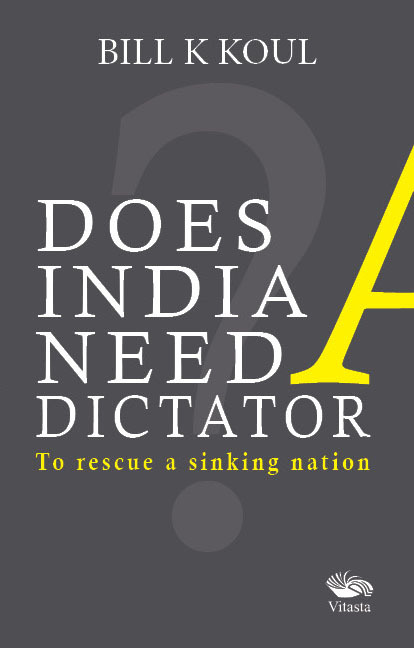 It is an expression of the author's feelings, personal observations and deep concerns about India's very survival. The author believes the current political infrastructure in India is inadequate in truly addressing the issues that seriously undermine the country–increasing population, dwindling liveability, environmental degradation, corruption, poor education of the masses, poverty etc. He believes a significant transformation in the political infrastructure is necessary to address those issues, for which an authoritarian government, headed by a benevolent dictator, is necessary for at least one generation. Kashmir has a special coverage in this book. The author believes a peaceful Kashmir is vital for India's good health and integrity. This book should be of interest to the policy makers in India and all those readers who are interested in political science and legislation, education, environment and sustainability of India. Bill is an engineering consultant, writer and editor. He resides in Perth, Western Australia. This book is a sequel to his earlier book, Issues White-anting India. He has also written two other books – Twenty Two Years, a memoir of his earlier life in Kashmir, and My life does not have to be happy, a book on well-being. Bill is a current Fellow and Chartered Professional Engineer of Engineers Australia, an APEC Engineer and an Associate Fellow of the Australian Institute of Management. He has more than three decades of international work experience. His interests include philosophy, spirituality and nature, and his hobbies include cricket and long distance running. Bill publishes regular blogs on his website (https://billkkoul.com) on varied topics – politics, philosophy of life, gender equality, life and liveability etc.